Nathan Edward Galloway was born in 1880 in Springfield, Missouri and began wood carving as a boy. During the Spanish-American War he joined the U.S. Army and saw service in the Philippine campaign of 1899 1901. He left the army in 1904 to return to Springfield, where he married Villie Hooten in 1904 and later adopted a son, Paul. In 1914 the artist is said to have made a number of large, complicated wood carvings to enter in the 1915 Panama-Pacific Exposition, but virtually all were destroyed by a fire before being sent to California. He became proficient in woodworking and blacksmithing and obtained employment at Sand Springs Home, teaching manual arts to orphan boys. In 1937, he retired to live on the property now known as the Totem Pole Park. He constructed a vernacular Craftsman residence, a smokehouse, and a workshop (which no longer exists). He began to make violins, furniture, and decorative wall art. Galloway became interested in Native Americans and found inspiration in post cards and National Geographic magazines to construct totem poles in the park. 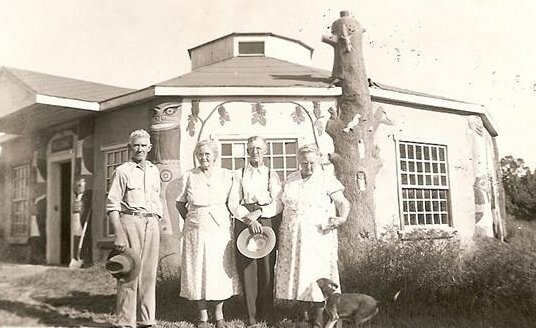 Between 1937 and 1948, he created a 90-foot tall main totem pole heavily carved with bas-relief designs, the largest art object on the property. This totem pole is made of red sandstone framed with steel and wood with a thick concrete skin and sits on a large three-dimensional turtle. The turtle forms the base and is carved from a broad, flat outcrop of sandstone in place on the site. The totem pole is hollow and ascends nine “floors,” with the ground floor measuring nine feet in diameter. The plastered interior depicts painted murals of mountain-and-lake scenes and bird totems. Native American shields and arrow points line the tops of the murals. At the very top, the cone is open to the sky. Other totems include a pre-1955 Arrowhead Totem, a c.1955 Birdbath Totem, and a Tree Totem dating c. 1955-1961. The park also includes two sets of concrete totem picnic tables with seats, a concrete totem barbeque/fireplace, small bird gateposts, as well as the Fish-Arch gates designed by Galloway to look like a gar-like fish with bird images facing east and west. Please activate your imagination and travel along while we visit the old Hootontown sculptor and woodcarver. Keep in mind fellow writer Ray Gold’s reminiscences regarding Model T travel: “…We didn’t have no paved roads, th brush all growed up on both sides of a little ole narrow, rough, one-way road. We hat to watch fur limbs a stickin out a little too fur, hits jest kinda like runnin into a clothe line, hit sure would git your attention…”** But then, as now, Ed Galloway’s sculptures are worth the trip! Nathan Ed Galloway, born in 1880, married Miss Vila Sue Hooten and at once embarked upon a fantastic journey of “non-traditional” creative artistry in the small town of Hootontown, named after Vila Sue’s ancestor, Will Carver Hooton. Galloway’s most notable legacy to northeastern Stone County is his famous Lion In A Cage wood sculpture. It is housed in Dickerson Park Zoo, Springfield, Misouri. The plaque beneath it reads: “Carved…for the 1915 World’s Fair in San Francisco. 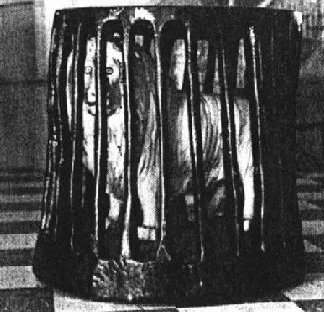 Life-sized lion in a cage, carved from a single solid piece of sycamore…A 1970 Hillcrest High School class restored and painted the piece. It was taken off exhibit in 1980 and remained off display until 1992 when it was refinished by zoo staff and the Springfield Wood Carver’s Association.” Galloway’s lion was standing guard in the Reptile House when I discovered it. Technically, the big cat is “the oldest animal in the zoo.” His very existence is a miracle of unfathomable talent. The lion’s size and dignity is both chilling and inspiring, yet the man who carved him is only vaguely remembered in Stone County, Missouri, as something of an enigma. Galloway’s lion was carved during 1912 and 1913. Less famous but equally unususal works, some of massive dimensions, were also carved and exhibited in Hootontown, including “The Woman And The Snake,” a lifesize sculpture of an enormous snake encircling a wooden woman. The Model-T folks were surely enraptured as they examined such unheard of art deep in these Ozark hills! It is said that Galloway was having financial trouble making arrangements for the 1915 World’s Fair exhibit when he had the good fortune to meet with Charles Page, of Sand Springs, Oklahoma. Mr. Page persuaded Galloway to teach woodworking at the Charles Page Orphan’s Home in Sand Springs. And so it was that Ed Galloway devoted the next 22 years of his life sparking the esteem and creativity of the home’s orphan children, his greatest achievement by far. 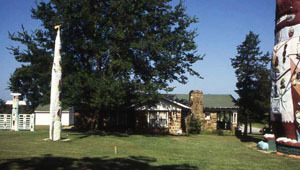 When he retired in 1936, he and Vila Sue (known as Villa) moved to a farm at Chelsea, Oklahoma, where Nathan Edward Galloway began what might be considered the most unique phase of his life’s work. In preparation for this writeup, I had a very pleasant conversation with Carolyn Comfort, Chairperson of the Totem Pole Park. Carolyn answered the phone at the park’s museum/gift shop. (That number is 918-342-9149.) She invites everyone to a special fundraiser bar-b-que on Saturday, June 17, 2000. Most of the park structures belonging to Galloway have been rennovated and are now open to the public, including a playhouse built for a grandson. The Totem Pole Park is 4 miles east of Route 66, on Oklahoma Highway 28A, near Foyil and northeast of Claremore, Oklahoma. Ed Galloway is quoted as saying, “All my life, I did the best I knew. I built these things by the side of the road to be a friend to you.” Should you happen to visit Galloway’s last great marvels of stone and wood near Foyil, Oklahoma, think back on these kind words as you drive along Highway 28A. Think then also of Stone County’s oldtimers who sallied forth in Model T’s (or on foot, on horse or mule, in buggy, by boat, etc.) for a bumpy, exciting trip to Hootontown’s famous Galloway Studio. Pictured from left: Ed Galloway and wife Survilia “Villa” Hooton, (daughter of Ben and Rachel Jane Hooton), Felix (son of Wm. Carver and Matilda Jackson) and Ida Melton Hooton, daughter of Ancil Marion Melton and Margaret Atterberry. Villa is the niece of Felix Hooton. The photograph may have been taken in Oklahoma. *Hootontown is sometimes spelled as Hootentown or as two words with either the “on” or “en” version. The town is named after the Hooton pioneers. “Lion In A Cage” photograph is courtesy of Dickerson Park Zoo.